Designed in 1862 by J. J. Stevenson of Campbell Douglas & Stevenson, this Gothic Revival church was altered by Honeyman, Keppie & Mackintosh in 1909. 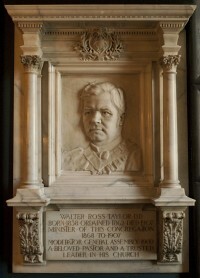 They reconstructed the organ, pulpit and choir platform, and made other internal changes, including the installation of a memorial to a former minister, the Rev. Walter Ross Taylor. Authorship: A history of the church published at the time of the 1909 alterations says that John Keppie was responsible for the work. Alternative names: �ran M�r, Kelvinside Free Church, Kelvinside (Botanic Gardens) Church, Kelvinside Parish Church, Bible Training Institute. 1: Includes �125 for architects' fees. 2: Kelvinside United Free Church, Glasgow: A Record of Fifty Years, 1859–1909, Glasgow: Robert MacLehose, 1909, p. 139.